1. Patino L, Afanador A, Paul JH. A spotted fever in Tobia, Colombia. Am J Trop Med. 1937;17:639-53. 2. Walker DH. Rickettsia rickettsii: as virulent as ever. Am J Trop Med Hyg. 2002;66:448-9. 3. Walker DH. Rocky Mountain spotted fever: a seasonal alert. Clin Infect Dis. 1995;20:1111-7. 4. Walker DH, Bouyer DH. Rickettsia. En: Murray PL, Baron EJ, Jorgensen JH, Pfaller MA, Yolken RH, editors. Manual of Clinical Microbiology. 8th. Washington: ASM Press; 2003. p.1005-14. 5. Walker DH, Valbuena GA, Olano JP. Pathogenic mechanisms of diseases caused by Rickettsia. Ann NY Acad Sci. 2003;990:1-11. 6. Walker DH, Lane TW. Rocky Mountain spotted fever: Clinical signs, symptoms, and pathophysiology. En: Walker DH, editor. Biology of Rickettsial Diseases. First edition. Boca Raton: CRC Press; 1988. p.63-78. 7. Walker DH, Crawford CG, Cain BG. Rickettsial infection of the pulmonary microcirculation: the basis for interstitial pneumonitis in Rocky Mountain spotted fever. Hum Pathol. 1980;11:263-72. 8. Walker DH, Mattern WD. Acute renal failure in Rocky Mountain spotted fever. Arch Intern Med. 1979;139:443-8. 9. Walker DH, Mattern WD. Rickettsial vasculitis. Am Heart J. 1980;100:896-906. 10. Kaplowitz LG, Fischer JJ, Sparling PF. Rocky Mountain spotted fever: a clinical dilemma. En: Remington JS, Swartz MN, editors. Current Clinical Topics in Infectious Diseases. New York: McGraw-Hill Book Company; 1981. p.89-108. 11. Walker DH. Rickettsial diseases: an update. Monogr Pathol. 1982;23:188-204. 12. Helmick CG, Bernard KW, D'Angelo LJ. Rocky Mountain spotted fever: clinical, laboratory, and epidemiological features of 262 cases. J Infect Dis. 1984;150:480-8. 13. Benavides E, García P, Patino R. Babesiosis en humanos en Colombia? Bogotá: Corporacion Colombiana de Investigacion Agropecuaria; 2007. p.1-23. 14. Hidalgo M, Orejuela L, Fuya P, Carrillo P, Hernández J, Parra E, et al. Rocky Mountain spotted fever, Colombia. Emerg Infect Dis. 2007;13:1058-60. 15. Treadwell TA, Holman RC, Clarke MJ, Krebs JW, Paddock CD, Childs JE. Rocky Mountain spotted fever in the United States, 1993-1996. Am J Trop Med Hyg. 2000;63:21-6. 16. de Lemos ER, Alvarenga FB, Cintra ML, Ramos MC, Paddock CD, Ferebee TL, et al. Spotted fever in Brazil: a seroepidemiological study and description of clinical cases in an endemic area in the state of Sao Paulo. Am J Trop Med Hyg. 2001;65:329-34. 17. Ruiz BR, Herrero Herrero JI. Deleterious effect of trimethoprim-sulfamethoxazole in Mediterranean spotted fever. Antimicrob Agents Chemother. 1992;36:1342-3. 18. 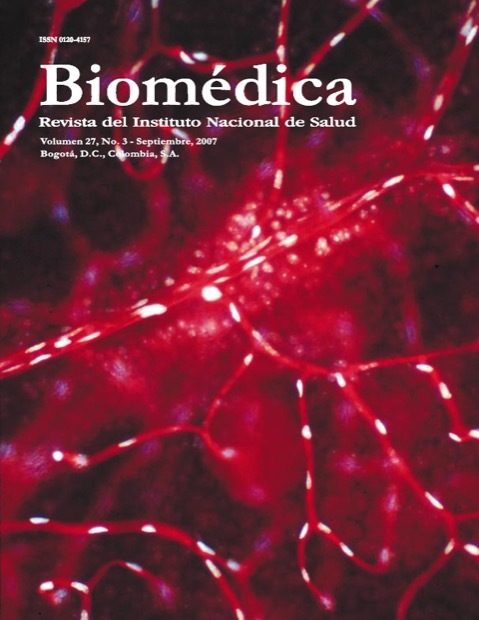 Hidalgo M, Castañeda E, Méndez J, Travassos da Rosa A, Valbuena G. Detección de anticuerpos contra arbovirus y rickettsias en sueros provenientes del programa centinela de entidades febriles, 2000-2004. Inf Quinc Epidemiol Nac. 2007;12:81-5. 19. Miranda AM, Flórez S, Mattar S. Alta seroprevalencia de rickettsiosis en trabajadores del campo en el municipio de Ciénaga de Oro, Córdoba. Inf Quinc Epidemiol Nac. 2001;7:71-5. 20. Childs JE, Paddock CD. Passive surveillance as an instrument to identify risk factors for fatal Rocky Mountain spotted fever: is there more to learn? Am J Trop Med Hyg. 2002;66:450-7.